Benedict de Spinoza was a Portuguese-Dutch philosopher. I'm going to pretend I sort of knew that before I wiki'd it. I only took the intro to philosophy course in college to fulfill my gen ed requirement, and on the final exam I simply regurgitated the limited tidbits they had shoved down my throat over the previous 3 months and somehow wound up with an 'A.' Perhaps it's another result of my philosophical ignorance, but I'm not sure why this man has bagels named after him. My guess is that it's because he was Jewish, and bagels are pseudo-traditional Jewish cuisine. Funfact: Spinoza was later expelled from Judaism because of his controversial ideas about God and the Hebrew Bible. 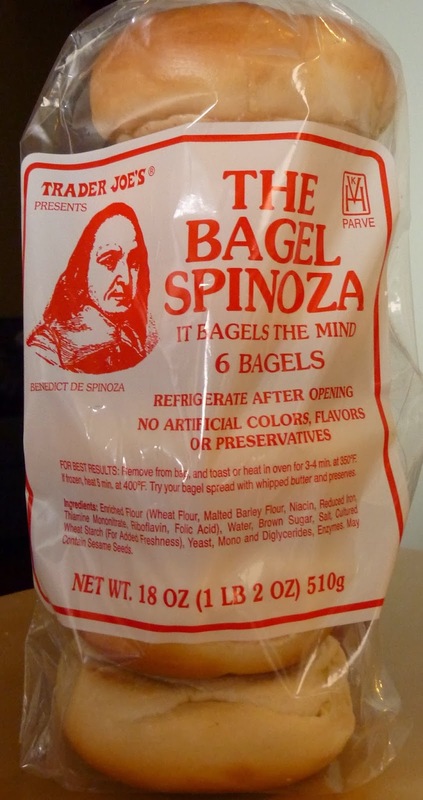 Who knew that centuries later he would make up for his heresy by offering the world these soft, delicious bagels? They're actually much softer than most bagel brands I've tried. Although, I must say that some of the best bagels I've ever had have been somewhat rigid. Not these. They're fluffy. Good, but fluffy. They're plain, just the way I like 'em. Check out Everything Bagel Slims and Everything Bagel Chips if you're looking for something with a bit more complexity in the flavor department. In this case, though, I think their simplicity is their strength. Nothing but a scrumptious white-bready flavor. Even though I've made a promise to avoid the topic of pumpkin for a few posts, I must at least mention that these are the bagels we ate with the pumpkin cream cheese. They were a great combo. Recently, a reader mentioned that he was not thrilled with the pumpkin bagels from TJ's, so I must recommend these, coupled with the aforementioned pumpkin cream cheese, as an alternative. But don't worry, that's it for pumpkin...at least for now. I haven't been able to make it back to TJ's lately to be tempted by their plethora of palatable pumpkin products, although my last visit to Target involved the purchase of Pumpkin Harvest Salsa. It's a conspiracy, I tell you. Sonia says she liked these bagels because they were soft and fresh, but she wonders if maybe we just got a bag that happened to be brand spanking new. The bagels didn't last around our place long enough for us to find out if they got much stiffer over time. She gives them a 4.5. I think they're worthy of 4 stars. Yeah, we used to live in L.A. and I don't remember seeing them out there. Bagels are pretty big here on the east coast. Bagels should be "stiff"...at least chewy,with a hard crust. Otherwise NOT bagels. So maybe that heresy is why they are named for Spinoza. Apostatic "bagels". Tried these bagels and thought they were just average. Oh well. Like them better than Thomas bagels- TJ bagels are lighter and not so heavy- when I want a heavy bagel- I will make a run to NY! I bought the Cinnamon Raisin bagels. These are terrible and leave an odd almost oily taste in my mouth. Never ever will I buy these again. Totally gross. Ummmm...they say they are vegan. Yet there's brown sugar in them?